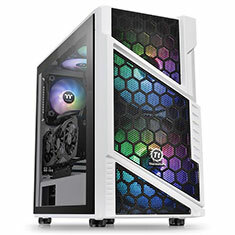 The Commander C31 TG ARGB features an enlarged tempered glass side panel, pre-installed two 200mm 5V a RGB front fans and ONE 120mm standard rear fan for optimal system ventilation. The 200mm 5V a RGB front fans deliver 16.8 million-colour RGB illumination and sync with RGB Capable motherboards from ASUS, Gigabyte, MSI and ASRock. The Commander C31 comes equipped with GPU mounting, advanced cable management and the flexibility for high-end components.